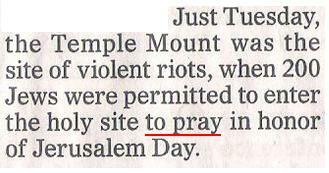 For two consecutive days last week, the English edition of Ha’aretz falsely reported that Jewish prayer is permitted on the Temple Mount. This is an egregious error in light of the fact that only Muslims are permitted to pray at the site. That Jews are completely prohibited from praying at the Temple Mount, Judaism’s most sacred site, is an underreported and little-known fact about Jerusalem, a city that draws intense scrutiny and coverage. Even in the Cave of the Patriarchs in Hebron, another site of intensive conflict and coverage in the past, there is a very clear division which provides an area for Jews to pray, and a separate area for Muslims to pray. In addition, there are 10 days in the year in which the compound is open only to Jews, and another 10 days in which the compound is open only to Muslims. At the Temple Mount, there is no such equitable division. Muslims are the only ones who enjoy the freedom to worship all year long, and members of other religions do not have even one day in the year to realize their freedom to worship at the Temple Mount. Given that the article had already reported that police “allowed some 200 Jews to enter the Temple Mount to pray,” uninformed English readers would reasonably deduce, wrongly, that the status quo allows for Jewish prayer at the holy site. CAMERA continues Ha’aretz to correct this latest mistranslation. For the Hebrew version of this post, please see Presspectiva.